The airport claims that this is so the exits can’t be used as an entrance, thus saving them the $11/hour that they used to pay to have a security guard make sure no one goes the wrong way. It’s unclear how much the portals cost and how many thousands of hours of a security guard’s salary it cost to buy them. It’s also unclear why they would use these machines instead of a pretty ordinary one-way turnstile or, as some airports already use, entirely unobtrusive sensors that detect when someone is walking in the wrong direction and sound an alarm. What *is* clear is that these devices represent another opportunity for the TSA to violate the public. Perhaps the TSA sees you walking through the terminal and determines that you’re suspicious or. you know, your credit score wasn’t good enough. They can then lock you inside these machines for “additional screening.” What happens if there is a fire, or another terminal shooting, and people need to exit immediately? Surely there’s an “emergency mode” where the portals simply open, but does it work if the portal controller is on fire? The TSA comes up with an impressive quantity of bad ideas. Be sure to let Syracuse Airport know that you don’t appreciate their support of this one. I saw something similar in LAS terminal 3 last week. It makes sense to me–$11/hr * 24 hr * 365 days = $96,360. Figure insurance etc and you’re looking at around $120k/yr. One-way turnstiles won’t work because you have to cope with baggage and wheelchairs, in my experience the alarms go off many times per hour (it got very tiring waiting for my bag right near the alarm! ), I’m sure people are ignoring them. The ones here use independent doors rather than a one-must-be-closed type door. One of these days the TSA is going to kill somebody. These will cause bottlenecks, backed up lines, – more sitting ducks. Exiting Atlantic City Intl Airport in late October on a return flight from FL, I came upon the same thing, air-lock exits. I thought it was odd to see them but then figured it was the salary reason, as well as “security” too. Wonder what the fire marshalls have to say about these? I bet that they will install the “detention pods” AND place TSA guards next to them (either to make sure that no one is messing with the doors or course claim that it’s “for your safety”). That will make it obvious that it was not done for budget reasons. I found that in the US people will obey to the most absurd rules and laws as long as they are told that it’s “for your safety”. Imagine the government says that everyone who wants to board a plane will have to let strangers fondle their intimate parts first. No one will agree to that! But if they are tols that this is “for your safety”, then everyone (or almost everyone) lines up quietly and let strangers fondle their, and their kids’, private parts. Sad. Biometric Fingerprint Scanners Just to Leave the Airport? Does the TSA have any “precogs”? We’ve likened the TSA’s attempts to predict which travelers are would-be terrorists on the basis of their identities and profiles to the “pre-crime” police in the fictional film, Minority Report, who use “pre-cogs” with supernatural powers to predict who will commit future crimes. We’ve also pointed out that in reality, as distinct from Hollywood fantasy, there’s no such thing as a “precog”. The Constitution presumes that we are innocent until proved guilty, and requires probable cause (as determined by a judge, not a self-proclaimed or TSA-certified psychic) to believe that we have already committed a crime before we can lawfully be arrested. Every totalitarian government tries to make it difficult to travel and the TSA is fulfilling their role to this end. For over a decade, the TSA has become the symbol of the state’s superiority over the individual. With the unwarranted second sexual assault practices being committed against the flying public every day, the TSA is taking their tyranny to a new level. 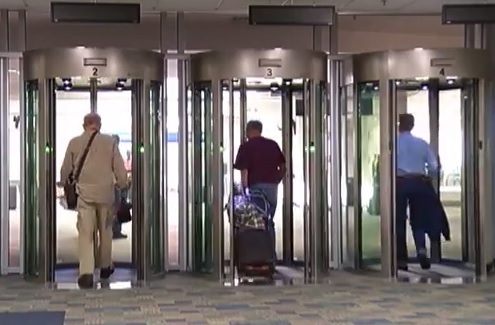 Have you heard about the new mini-jails that the TSA has placed at Syracuse Airport? Passengers are forced into a bottleneck as they pass through what are called pods as they leave the terminal. A futuristic, female voice gives instructions to wait inside the pod until a green light is shown and the door opens. Travelers can become electronically trapped or detained at the whim of the TSA. This is just one more example of the conditioning that the TSA provides for the establishment which is teaching the American people that your body does not belong to you, it belongs to the state. The pods are part of a $60 million dollar renovation. The installation of these pods are most certainly headed to other major airports as well. While in the pods (i.e. jail) a passenger can be detailed for further interrogation (i.e. molestation). Some of the passengers exiting through the pods at the Syracuse airport thought the machines were performing x-ray body scans. If one is lucky enough to exit the pods, they are not permitted to re-enter the terminal. I view these pods as conditioning for future FEMA camp deportation and incarceration. Syracuse Airport Commissioner, Christina Callahan said, “We need to be vigilant and maintain high security protocol at all times. These portals were designed and approved by TSA which is important.” Christina is also partaking in the TSA tyrannical Kool-Aid as well. Not only is this going to cause the price of flying to skyrocket, it is turning our airports into being more like prisons than ever before. I’m forced to agree with you. To slow down and possibly detain people leaving the airport, after they have presumably been screened before getting on their flights, taken the flight, landed and disembarked makes no sense at all. To do it with these expensive, biometrics-enabled man traps is an absurd waste of money at best. (If what they really wanted to do is keep people from coming in the exits, the venetian-blind turnstile revolving doors amusement parks use would be more than adequate!) I think Infowars is more than a little insane, but I can’t believe anymore that this is 100% stupidity on the part of the federal government, who is perfectly on the level with the fact that the US has the highest incarceration rate in the world already and over three thousand people sentenced to life without parole for non-violent crimes. If this FEMA prison camp stuff is on the money, it’s pretty obvious why it would be “classified” (see next blog post.) Mere stupidity can be forgiven, and if that were the case, it makes too much sense to come clean by this point. As much as I hate to think the US could really be that evil, no other scenario fits these facts. God help us.